Why is everyone so surprised by Jordan Henderson's recent perfromances? I mean you dont become Liverpool's captain unless your a very good footballer and Jordan is a exactly that, "A very good footballer". Spending most of his time on the bench since Fabinho was brought in from Monaco, Henderson has found it hard to break into Klopp's starting 11 this season. Showing true professionalism, Henderson has never complained or caused problems in the dressing room. Instead he worked harder than ever and waited patiently for his chance to show his qualities. That chance came last week when he was called upon from the bench against Southampton with 30 minutes remaining and the scoreline evenly poised at 1-1. Henderson had a point to prove and boy did he do it, providing an assist and a goal to give the reds a pivotal 3-1 victory which could be crucial to there title challenge. That perfomance earned him a rare start in the midweek Champions League clash versus Porto and he didn't disappoint. Henderson was like a man possessed, running everywhere, breaking up the play and offering an attacking outlet throughout. He was also heavily involved in Liverpool's second goal playing a defense splitting pass to carve open Porto's rugged defense which led to Roberto Firmino tapping it in to make it 2-0. Fast forward to Sunday when Liverpool faced a must win game against Chelsea and were hoping to banish the ghosts of the 2013/14 season, when that infamous Gerrard slip cost them the title. Step forward captain fantastic who burst into the box and crossed a delightful ball for Sadio Mane to open the scoring and give them a 1-0 lead. Salah scored an absolute worldie to settle the game and put Liverpool top of the table again but the real catalyst for victory was none other than Liverpool's very own Captain Marvel. In all my years as a Liverpool fan, I have never seen a player as maligned as Henderson is. At times the criticism has been justified but people forget Henderson has been asked to play a position he is not comfortable with or suited to. Henderson is a box to box midfielder, attacking and defending in equal measure and covering more grass than the gopher from caddyshack. The player himself recently admitted his frustration at being asked to play in a deeper role and Liverpool's manager Jurgen Klopp apologised for not utilising the midfielders qualities and playing him in a more advanced position sooner. 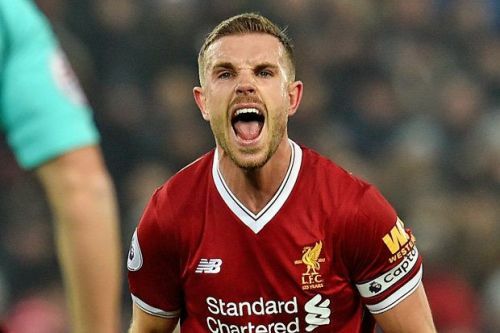 With Henderson back in his favorite position and Liverpool challenging for the title, there is no better time for the real Jordan Henderson to stand up.